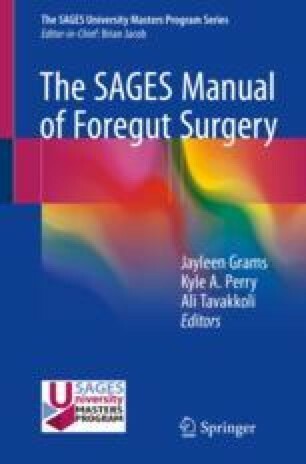 Postgastrectomy syndromes occur due to loss of pyloric function or normal vagal innervation after gastrectomy or vagotomy with or without drainage. The choice of gastrointestinal reconstruction also affects the type of symptoms that a particular patient develops. Postgastrectomy syndromes can be categorized as rapid-transit or slow-transit disorders. Rapid-transit disorders include dumping syndrome and post-vagotomy diarrhea, while slow-transit disorders include delayed gastric emptying, alkaline reflux gastritis, and Roux limb stasis. Diagnostic evaluation involves a combination of clinical history, upper endoscopy, radiographic imaging such as an upper gastrointestinal series, and functional studies such as a gastric emptying study or a fasting oral glucose challenge. Management generally consists of an initial attempt at dietary modifications followed by a trial of medical therapy. Effective surgical options exist for each syndrome, but reoperation remains a last resort in each case. Surgery ASfMaB. Estimate of bariatric surgery numbers. 2011-2015. 2016. https://asmbs.org/resources/estimate-of-bariatric-surgery-numbers. Accessed 10 Oct 2016.